MILLBROOK -- One hundred and fifteen years of unbroken family history, intimately interwoven with community and township progress was fittingly commemorated at the annual Deyell reunion on July 1st, the special feature this year being the unveiling of a handsome Memorial Window in the Centreville Presbyterian church, in honour of John Deyell and his wife, Margaret Lancashire, the first actual settlers of Cavan Township. 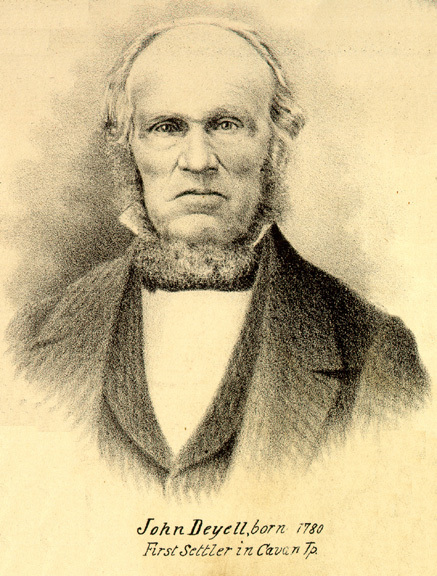 Coming out from County Monaghan in Ireland with his wife and three children, the family later increasing to nine, five sons and four daughters, Mr. and Mrs. Deyell braved the hardships and severe toll of pioneer life, the family homestead, grown from small beginnings being located less than one mile south of Centreville, on the provincial highway. The brick house, which finally replaced the original log cabin, which in turn was the first hostelry in Cavan township, and for nineteen years bore as its sign, "Live and Let Live", the favourite saying of the owner and consistently reflected in his life and conduct, has been for some time unoccupied, but in the orchard are still trees grown from the apple seed planted by John Deyell. Descendants of the nine branches of Mr. and Mrs. Deyell's family are scattered widely over the North American continent, but approximately two hundred of them gathered for the reunion on Wednesday, and in spite of the extreme heat the event was a marked success and thoroughly enjoyed. In view of the fact that the first settler in Cavan donated the land on which the Presbyterian place of worship in Centreville is located (with its surrounding cemetery) the interior of which is beautifully furnished and well cared for, it was most fitting that this year's gathering should begin with a solemn and impressive service in the church. Rev. D.N. McCamus of London, a life-long friend of the Deyell family as were his parents before him being in charge unveiling the Memorial Window and dedicating it to the glory of God. "We are about to open this historic service," was the minister's announcement and the congregation rose and sang the appropriate hymn, "O God of Bethel by Whose Hand Thy People Still are Led", following which Rev. Mr. McCamus offered prayer and read the Scripture lessons from the Book of Psalms and of Revelation. Robert Deyell, of Centreville, chairman of the Reunion Committee on behalf of the entire Deyell family connection, presented the window to the church officials "as a lasting memorial of our worthy grandparents, this window is dedicated and presented to the people of Centreville Presbyterian church, with the hearty co-operation of the church board." D.N. Dodds, representing the church session, made reply, mentioning the fact that John Deyell not only gave the land on which the church stood, and where first there had been a schoolhouse, but had also signed the call to Rev. John Douglas, the first minister on the charge. "The church is the third building erected on this lot, and the Deyell race has always taken an active part in church and Sunday School activities in this place, our confidence being that this interest and practical help will continue through all the years ahead. The first home my grandfather entered in Cavan township was that of Mr. and Mrs. John Deyell, where he was given a warm welcome and he invariably spoke with the utmost kindness and appreciation of the earliest pioneers of this township. We do well recall these pioneers, "lest we forget" what an unpayable debt we owe to them." "We dedicate this Memorial Window in the Name of the Father, the Son, and the Holy Ghost, and in reverent memory of John Deyell, and of Margaret Lancashire, his wife, worshippers of the true and living God in Centreville bearing testimony to the value of the gospel in their own well-ordered lives; making an influence that has lived to this present; manifesting how beautiful a thing it is to minister according to their ability of the people of this family today. Therefore we dedicate this window to the service of God, the worship of His Name, and the inspiration of His people. " The window, which was installed by an Ottawa firm, has four panels, and is peculiarly appropriate to the memory of pioneer settlers, the first panel showing the traveller on horseback, with saddle-bags and rifle, and in the background the oxen, and the log cabin home; its counterpart in the fourth section, depicts the early settler sowing the grain by hand; and in the richly-coloured centre panels the figures are of an apostle and an angel, while inset in the small diamonds into which the stained glass is subdivided are farm implements and animals of pioneer days; household articles such as a lighted candle; hints at our forefathers' neighbours implied by the Indian headdress and wigwam; the covered wagon; the ripened grain loaded for carriage to the barn; the church; the schoolhouse; the hourglass; and the fruits of the harvest. In his address, based on "Memory Observation and Imagination" the minister made reference to the Holy Bible in the circle above the panels on the left side, which the pioneers being remembered had brought with them, and honoured in their home and lives; the central circle with the intertwined letters of the Alpha and the Omega, "reminding us of Him Who is the beginning and the end of all"; and the burning bush in the third circle, "the type of the Presbyterian church, on fire for God and His Cause." Interesting reminiscences recalled by the speaker included the fact that his parents came to Canada in 1844 from Manchester, England, his mother being the daughter of a Presbyterian missionary in that city and his father an Anglican. "They worshipped in this church, Rev. J. Douglas being their minister and I have often heard them tell how my father would remain home and care for the children while my mother walked the full distance to service. Neighbours, Turnbull, by name, who usually rode on horseback, when they saw mother walking would turn back, hitch their horses to the lumber wagon, and drive her with themselves to church." Later, when his parents moved to the vicinity of Balieboro, Mrs. McCamus on the advice of her minister went with her husband to the Anglican church, which was nearer, and so all but the two eldest children were baptized in that place of worship. There was a further union later still "for my father, with his neighbours the Byers, who were Presbyterian, saw that there was no place for the young people to go on Sunday evenings, hence they agreed with the Sackvilles, Baptist by belief, to open a prayer-meeting in my parents' home, when I was but five years old, and it was carried on each Sabbath evening. My earliest recollections are associated with the families of this neighbourhood, many of whom are represented in this church today." In closing a most constructive address, Mr. McCamus urged "looking beyond the picture and knowing the Shepherd, and the Father Whom these pioneers worshipped and honoured in their day." Following the impressive service at the church, during which Miss Gwendolyn Hutchison presided at the organ, adjournment was made by car to Wallace Point, Otonabee River, where a delightful social gathering was enjoyed, and an abundant picnic supper served. The two oldest living representatives of the sons of John and Margaret Deyell, William Deyell of Lindsay who is eighty -three, and Mrs. Ruth of Peterborough, seventy-eight were among those present and especially warmly welcomed. High lights in the reminiscences informally related were the fact that John Deyell, "to prevent any jealousy, quarrelling, or bestowing of nicknames (since there has invariably been a John, William, and Robert in each family of descendants), settled each of his five sons in a different township, buying them each a good farm." So Otonabee, Ops, Smith, South Monaghan and Cavan have their Deyell settlements, the last two townships having been named by the original pioneer, after Monaghan and Cavan in Ireland. John Deyell's good horse "Bess" must have been an intelligent animal, for the story was told on Wednesday of his custom, when reaching the river bank and wishing to get across, of dismounting, ordering the mare to make her way over which she obediently did, the owner then removing his clothing, fastening it about his neck, and swimming over, where it was resumed and the journey proceeded with. The same method had to be employed on the return trip. Walking was an obligatory accomplishment of pioneer days, and the story was told of Mr. Deyell's desire to buy a piece of property at Fowler's Corners, which a neighbour also wanted. Seeing the latter driving by with is team and wagon one day and suspecting whither he was bound, John Deyell left his work, made a hasty toilet, and walked to the Corners, bought the land, and when leaving met the neighbour just arriving with his team. The property is in the family today. The part Mrs. Deyell played in the hard pioneer life, received due emphasis, particularly from the older among the guests on Wednesday, the labour involved in clothing her entire household, as well as providing the blankets and linens for her home, with the products of her toil at the spinning wheel, receiving emphasis as someone told of the visit of a relative from the Old Land and her exclamations over "such clothes" as she viewed the homespun-clad family. The Reunion Committee, through its chairman, Robert Deyell announced the annual for 1932 on July First, at the Point. The other members are Mrs. J.R. Eakins, Millbrook, secretary-treasurer; Mrs. (Dr.) Morrison, Peterborough; Jas. Thorne, Otonabee; John Deyell of the Watchman-Warder, Lindsay; and Jas. Hutchison, Cavan.